Rail staff have been threatened and spat at by frustrated passengers following months of delays and cancellations at London Bridge railway station, a union has said. The assaults and abuse of staff occurred during continuing disruption caused by major engineering works. The Rail, Maritime and Transport (RMT) union has written to train companies demanding action. 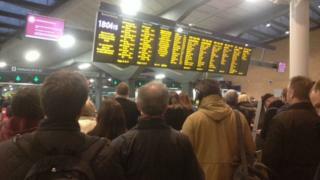 Network Rail said it was looking to make improvements. Passengers jumped over barriers on 4 March because of serious overcrowding and there were more problems on Monday because of a broken-down freight train. RMT general secretary Mick Cash said: "It is disgusting that staff charged with crowd control are being threatened, spat on and assaulted with hot coffee. "We want measures put in place immediately to protect our members from this threatening and abusive behaviour." One commuter, David from Highgate, told Vanessa Feltz on BBC London 94.9: "You have aggressive time-conscious passengers who are trying to go to work and there are not enough staff." Rejecting the claim that somebody could be seriously injured in the disruption, Chris Denham, from Network Rail, said: "Although it's very busy and it has been very difficult, safety has been our absolutely priority." Network Rail and the train companies have held a meeting on site at London Bridge, looking at what further improvements can be made.